While Florence can be heaving with tourists, it’s not necessarily a bad thing. More tourists means more foot traffic– and shops that can actually afford to stay in business. On my first visit to Florence, I was overwhelmed by the tourist tat and underestimated the shopping potential. 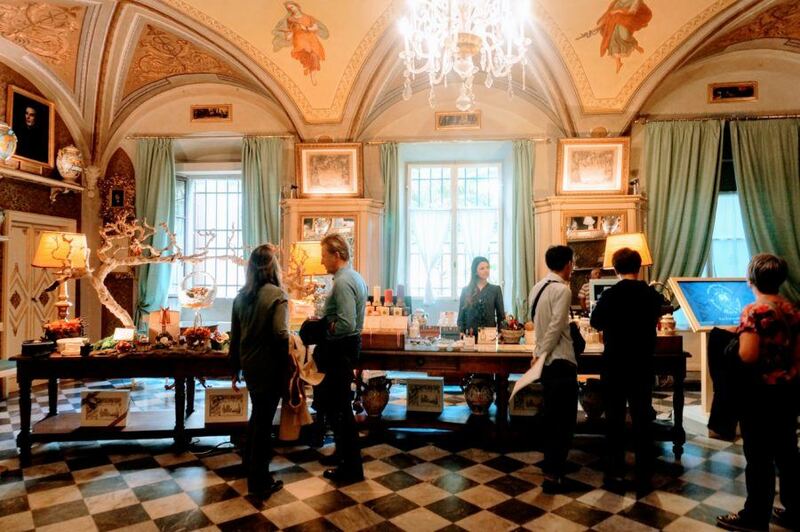 Fortunately, on this last visit to Florence, I dug a little deeper and found plenty of mom and pop shops, unique artisans studios and delicious food souvenirs sprinkled among the tourist shops. The Santa Maria Novella shop in Florence is technically a chain store– we even have an outpost in Manhattan. But this Italian pharmacy is a little different from your average Duane Reade. For one it was founded in 1221 by Dominican friars and the original Santa Maria Novella store still stands in Florence. The shop is absolutely gorgeous– part museum, part shop, with vaulted ceilings and 14th century frescoes. It’s worth visiting for the walk through alone. 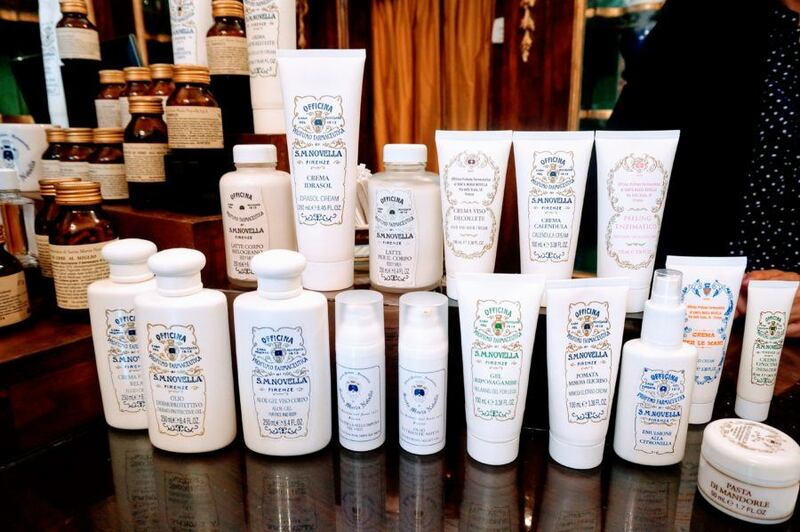 But then there are the souvenirs– the Santa Maria Novella beauty products. Many of the products are still based on their original formulas and don’t have all the preservatives and additives of more modern products. I’ve brought home many products and without reservation love them all (my favorite are the delicious smelling body lotions). Why buy these products in Florence when I have an outpost of Santa Maria Novella in downtown Manhattan? The prices here are a huge bargain– about half what they are in New York. The stores in Italy also over certain products not available in the US (like liqueurs). I’m obsessed with the Santa Maria Novella body lotions. The Santa Maria Novella store has several gorgeous rooms like this. Visit a real operating leather school in Florence, where you can watch apprentices at work then buy their wares at the large shop. All products at Scuola del Cuoio are handcrafted on site. While the leather handbag collection is the most extensive here, I found the best buys to be many of the smaller leather items– perfect for gifts. My favorite souvenirs were the snakeskin bracelets, a steal at 16 euros, and small leather change purses embossed with classic Florentine designs (a bargain at 8 euros). Italian ceramics are easy to find in Tuscany and Florence– if you’re an expert buyer you probably know what you’re looking for. If you simply want a reliable shop and great prices, I recommend my find, La Mie Ceramiche (I wrote about them here). Hand painted plates pack flat and make a great souvenir (I had to check mine last minute and they both survived intact). All the beautiful plates and other items are made on site, and the prices were better than the neighboring shops I checked out. 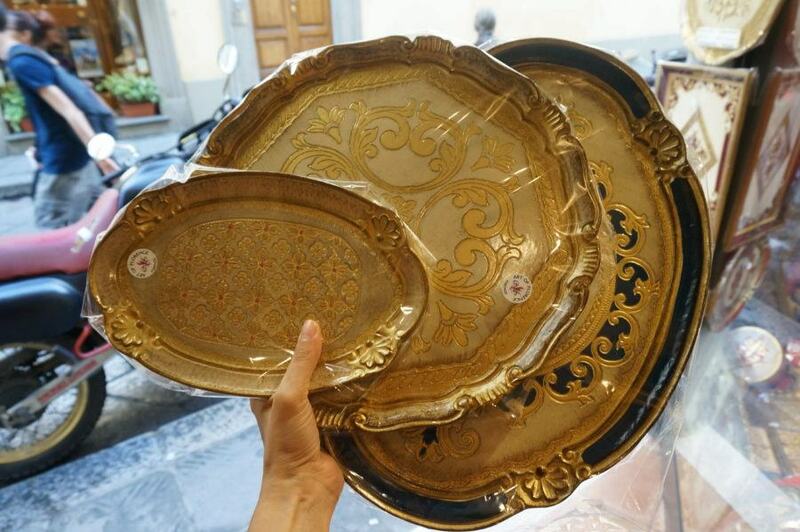 My Florentine plates have survived checked luggage and many, many moves. I was so taken by the talented sculptors at Galleria Raffaello Romanelli that I dedicated an entire post them here. While a fragile and heavy chunk of plaster might not seem a practical choice for your suitcase, there are many smaller items here (and they are experts at securely wrapping).The gorgeous sun-filled studio felt like a museum visit and shopping trip all in one. The sculptors are onsite and available to assist with ready to go items or custom orders. Florence sculpture studio: cherub christmas ornanment. I love shopping foreign supermarkets and try to write grocery store posts on each country I visit. While France is tops in supermarket finds, Italy comes in at close second. I bring home bags of truffle-flecked pasta, Italian cheeses, dried porcini mushrooms and Italian cookies. Tuscany has some of the most divine cheeses (my favorite is the pecorino near the Tuscan hilltown of Pienza). 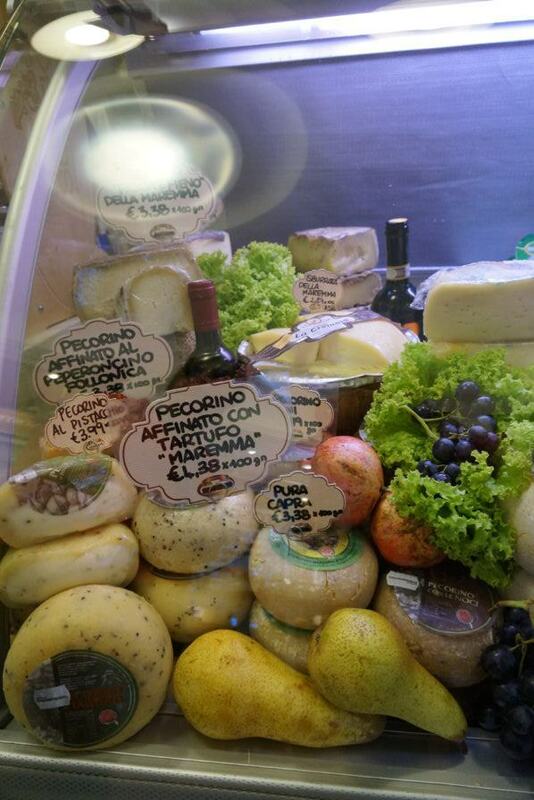 Florence has many cheese shops carrying cheeses from all around Tuscany. Sample all the different pecorino (best enjoyed with local chestnut honey). You’ve probably seen Marvis toothpaste at gift shops and high-end pharmacies, with their pretty colorful boxes and interesting flavors (anise anyone?) But I’m not interested in spending $8 for a small tube of toothpaste no matter how cute the packaging. In Italy, Marvis is priced like regular toothpaste so I make sure to stock up. 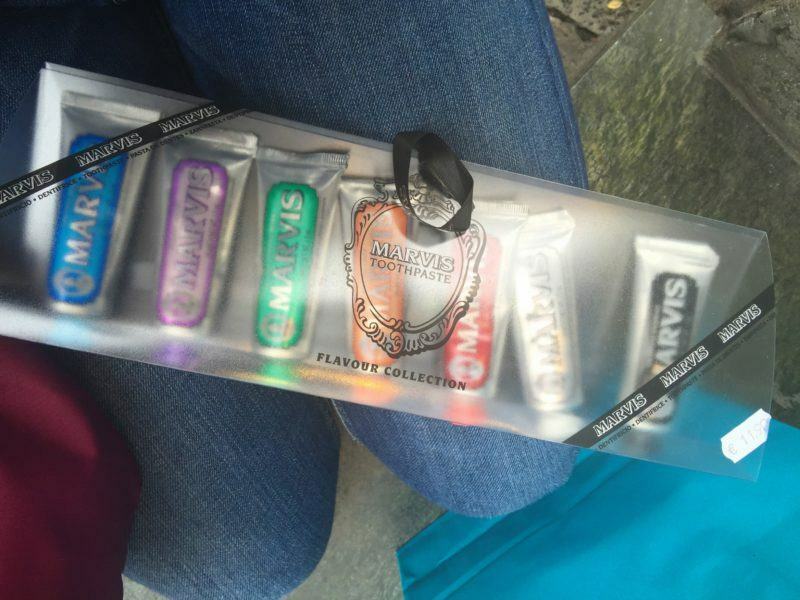 I also love the gift set with travel size tubes in different flavors– a great gift souvenir. Italian pharmacies are only second to French pharmacies in tempting beauty products, so make sure to browse the aisles for new finds. I find that they are very generous with samples so you can always try before committing to that new skin cream. And I always buy my sunscreen in Europe. The full size tubes of Marvis are the best value, but I also loved this gift pack of minis in different flavors– a perfect souvenir gift for the traveler. These were the three trays I brought home. 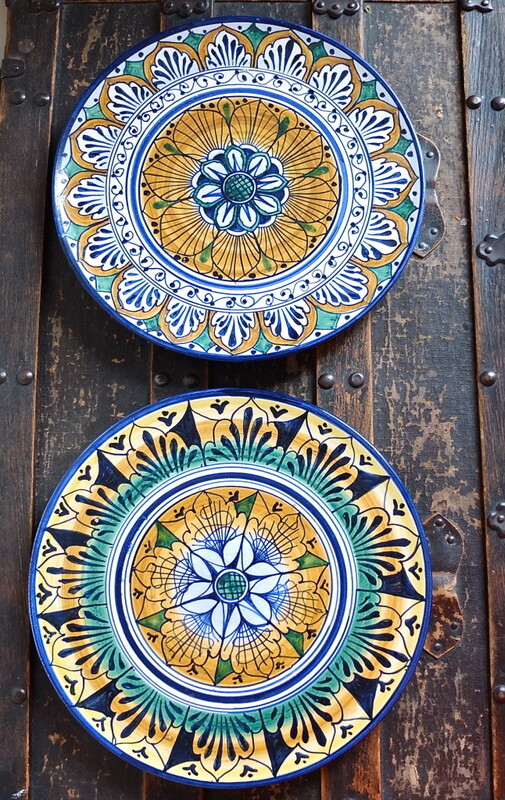 I’m not sure of the history behind it, but you’ll find entire shops of hand painted wooden trays in Florence. These trays actually make a great souvenir– lightweight, flat, sturdy and virtually unbreakable they are easy to pack. The pretty Florentine designs definitely give a sense of place, and I find trays to be useful back home (I have perfumes clustered on one on my dresser, remotes on one on a sofa table). You’ll find tons of variety in color and patterns. Prices vary depending on the shop. 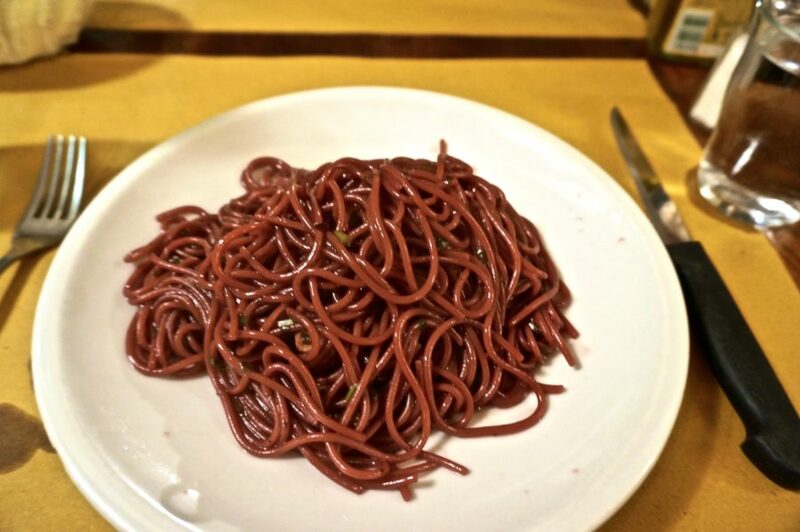 One of my favorite Florentine souvenirs is the recipe for drunken spaghetti made with red wine I received from our waiter at Osteria de Benci. Try the original at the Osteria, then follow my recipe in this post to replicate that addictive flavor back home. 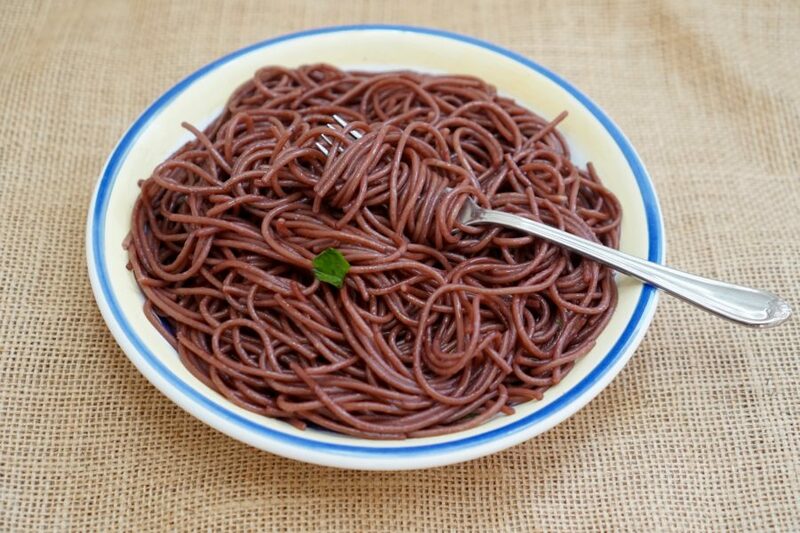 My version of red wine soaked pasta. In Florence you’ll find all sorts of paper products and souvenirs. You can find gorgeous hand marbled Florentine paper created by local artisans. I didn’t have much use for just paper myself, but I did love many of the paper products that used classic Florentine designs. 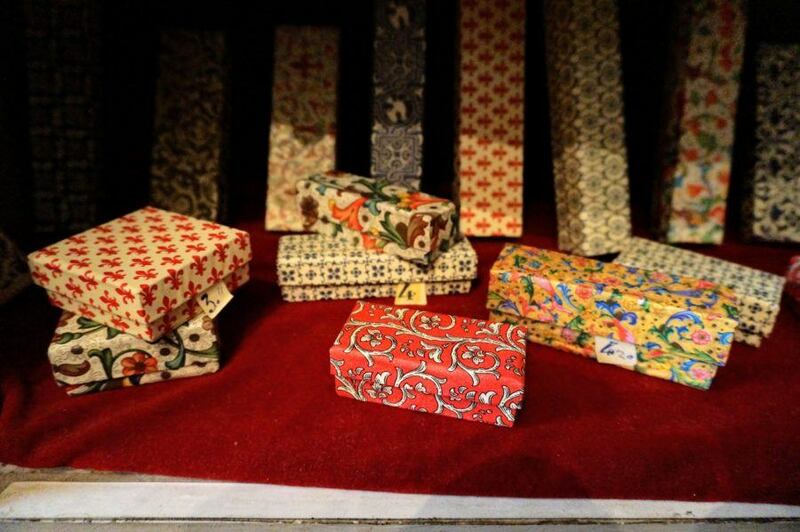 Adorable tiny cardboard boxes with Florentine designs. 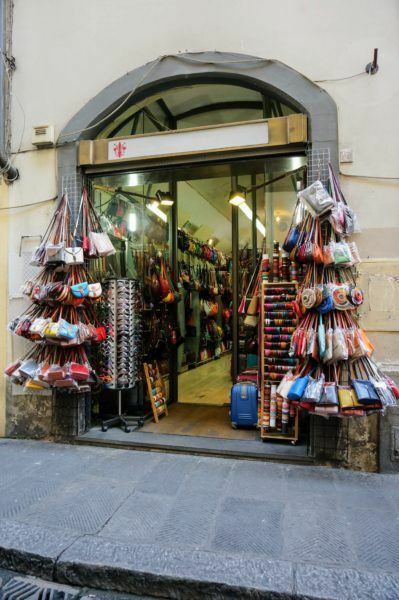 You’ll find lots of leather shops around Florence, mostly selling made-in-Italy leather goods. You can buy a high-quality leather handbag from a local designer, but it will cost you. I find most tourists in Florence are seeking something simpler– a cute, inexpensive handbag, locally made, and “good enough” quality. For a knockaround bag that will last a few seasons before showing wear and tear, you can hit any of the near identical touristy-looking leather shops. If you’re looking at these lower cost handbags my advice would be to buy a design you love and don’t spend a lot– so you won’t be disappointed if the bag falls apart in a few years (fading colors and unraveling hardware are the main issues). 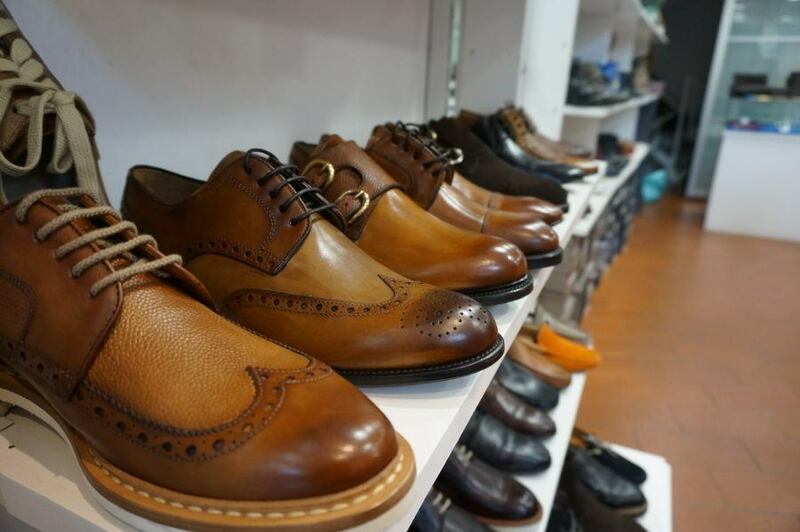 Drop into any of the shoe stores lining the streets of Florence for a huge variety of shoe shopping, for both men and women. You’ll find every kind of shoe imaginable– gorgeous shoes along with horrific tacky shoes. Quality will vary so use price as a guide and inspect your shoes carefully for workmanship. Be warned if you are shopping for a guy with large feet– mens’ shoes don’t usually go higher than the equivalent of a size US 12. Cameos are delicately carved shells, crafted into jewelry. Cameos have a long tradition in Italy, so you’ll find many versions to choose from– check the area on and around Ponte Vecchio. 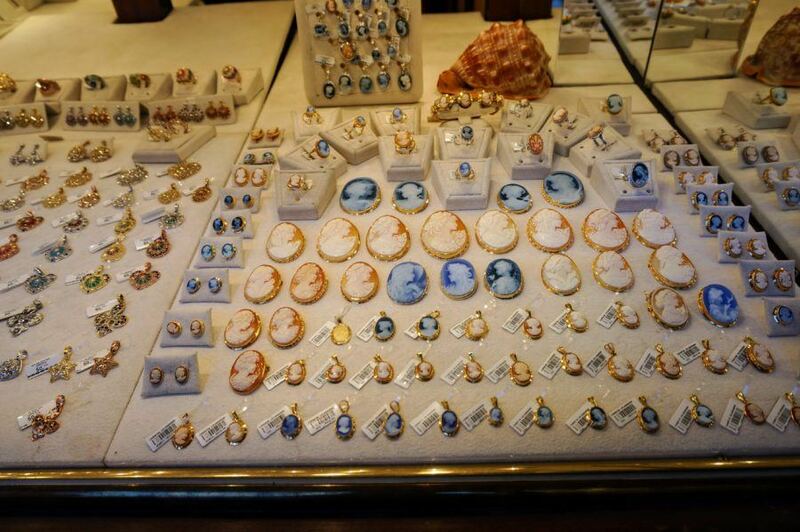 Cameos in all shapes and sizes at a shop on Ponte Vecchio. 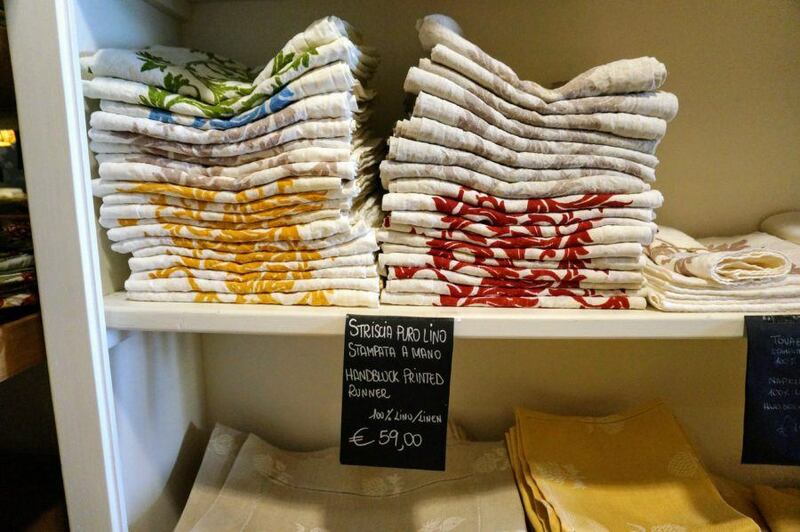 I adore beautifully Italian linens and my favorite Tuscan linen shop is actually in the hilltown of Montepulciano. But I’ve also bought linens in Florence, including a favorite tablecloth. Runners, placemats and napkins are the easiest linens to bring home. These linens were feather light and beautifully made. 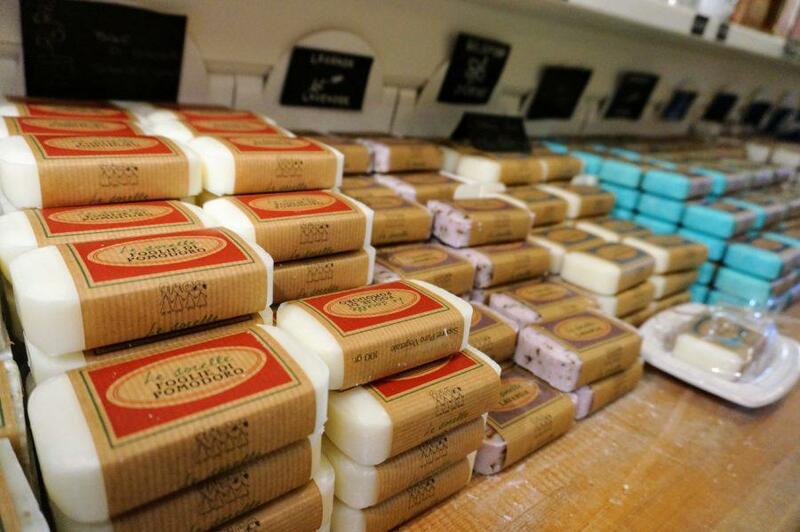 I found lots of delicious smelling and gift worthy soaps made locally– including this unusual tomato soap. 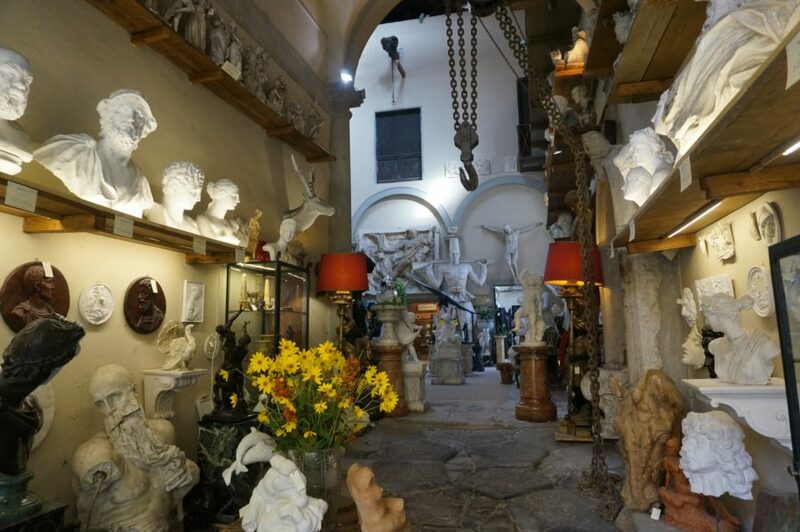 As an art-filled city, it’s no surprise that Florence is filled with art students– and art stores to supply them. 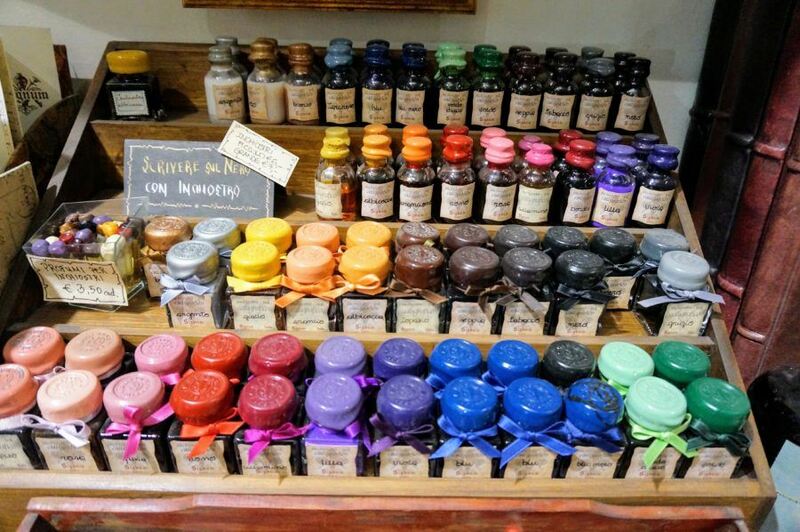 The beautifully presented paints and inks I saw made me wish I had a little more artistic talent to justify buying them. What are your favorite souvenirs from Florence? Tell us in the comments below! I just adore your website, Kristin! And this post reminded me why. The shopping vicariously through your writing! My first trip abroad as a high-schooler took me to Florence and my mom still raves about the necklace I brought her from there. I haven’t been back to Florence since then (horrors!) and your post made it sneak a little higher on my wish list. My first time visiting Florence was on a shore excursion in the fall of 2000. I bought some rosaries for some of my lady friends at work and nice handbag for my Mom. I didn’t know how to buy that thing, so I asked one of the ladies at the shop to model it for me. She did and I thanked her for doing so. Mom was pleased to get that bag when I came home, and she only carries it when she can match it with one of her outfits. I I didn’t see all that many magnets or lapel pins which I collect, but we didn’t have that much time for shopping before we had to walk back to the bus for the return trip to the ship. Hey Kristin, the next time you’re in Florence, how about telling me where I can buy lapel pins or military medals? You also might show some addresses where the shops you mention in this article so I can find them the next time I visit Florence. I’m a little concerned how you manage to take cheeses into the States. Aren’t they confiscated by Customs? Another unique perfume/soap place in Florence is the Farmacia SS Annunziata – its a family run business whose skincare and perfumes were originally made by monks in the 1500s. Hard to find in the US, I love their Cara perfume & get the shower gel and lotions when I’m there. Its on a side street near the Galleria dell’Accademia. Great tip! I’ll look for it on my next trip. Hi, I just finished reading this post and I have to say all the souvenirs here look so beautiful I wouldn’t mind going just for the sake of buying some. The last pictures has really awesome art supplies, do you remember the shop where you took the picture I would really like to buy some when I go. Hi Karla, I’ll do some checking with my friend and see if we can narrow down where it is (I think somewhere around Pont Vecchoio bridge?). But if a specific shop isn’t listed it’s pretty much because that type of souvenir can be found all over the place. There are lots of art and paper type shops all over the main tourist area, I’m sure you’ll find cool shops. 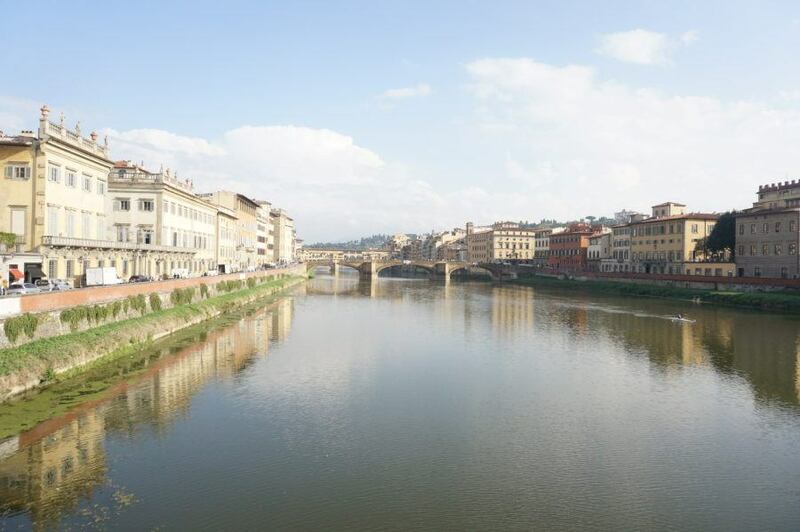 Loved this article, longing to get back to Firenze, saving this post. Thanks so much for the lovely compliment! 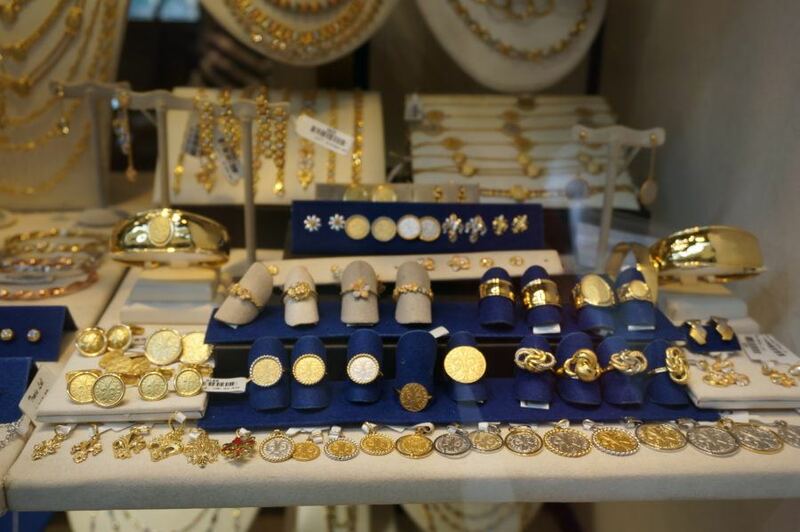 There is so much excellent shopping in Firenze, you will absolutely love it. Hi Kristen! Great post! I found you via your Pinterest Pin ( as a fellow travel blogger I’m always interested in knowing how people have found my articles). As I mentioned in a comment on your Pin, I’m heading back to Tuscany in September and am hoping to squeeze in a day or two in Florence once again. We’re staying over one night in Siena, right in the core not far from the incredible church. Do you have any shopping tips for Siena? I’ve been there but it was a whirlwind and I didn’t have a chance to shop there either last time! Hi Deborah! Ah I visited Siena before travel blogging days. I did write a short post on Palio souvenirs (the horse race). Each neighborhood in Siena has the equivalent of a coat of arms/mascot so it can be fun to find a favorite and buy something with the markings. But there is so much more shopping in Siena, I just didn’t have time to sort through it nor did I photograph anything. Let me know if you find anything cool, guest posts are welcome! Good luck with your blog too! Hi Kristin, I am planning a trip to Italy in September. Are they certain Souvenirs that they don’t allow us to bring back home to the U.S. in our. Suitcase? Hi! Do you happen to remember where you bought the wooden trays? I would love to get my grandmother one as a gift. Hi Caroline, you can find them at many shops around Florence. The shop I visited was not far Santa Maria Novella and had the best prices, I’m trying to see if I have a photo of the street name somewhere! Hi- I was wondering the same thing about the wooden trays- did you find out where you got them? Thanks so much for this post! I am taking a list of places you mentioned and can’t wait to get there. I work for DHS, and I know that meat, fruits, veggies, gel products, cheeses, and some baked products will be confiscated at Customs if you don’t declare them. Even if you do declare them, please refrain from bringing fruits and veggies into the country because they might have insects or diseases for which the US might have no defenses. Eat all of the fruits, veggies, cheeses, meats, etc., before you pack them into your carry-on or luggage. Chocolate is OK and so might be some bakery products. But I concur w/Kristin–check the “Is it legal?” item on her website. Best to be safe than sorry or embarrassed at Customs. Hi Kristin, Thanks for sharing these ideas. I am currently in Florence and I have been searching for that gift pack of Marvis toothpastes. Do you remember where you purchased it? If I can’t find it, I will buy the mini sizes in various kinds. Thanks! Hi Mary! I got them at a large pharmacy, but no idea which one! No worries. Thanks for your reply, Kristin! Hi Kristin! My sister and I went to Florence in 2002 and are going back in Oct/Nov. Your pictures of souvenirs make we want to shop again! When we were there in 2002, I purchased a tan leather zip up jacket and a pair of black leather pants from a small shop. Since we were there for 4 days, the shop owner custom fitted the pants for me and hemmed them and I picked them up a day or two later. I still wear the jacket, but can no longer fit into the leather pants although I will never get rid of them! I also was fortunate enough to purchase a gorgeous bedspread when we visited Alberobello in Puglia. Your post has inspired me to look into the gorgeous soaps and maybe even a pair of shoes! We will definitely visit the Florence leather school and try the red wine pasta at Osteria de Benci, Thanks so much for the information and your hand painted ceramic plates are to die for! Thanks for checking in Karen! Haha I know what you mean re: pants– it’s so hard to part with beloved souvenirs. Have an amazing trip and if you find any cool souvenirs please come back and let us know!